The holidays are just around the corner and its time to start your Christmas shopping. Memorable Gifts is here to help you find the perfect Christmas gifts for him this holiday season. 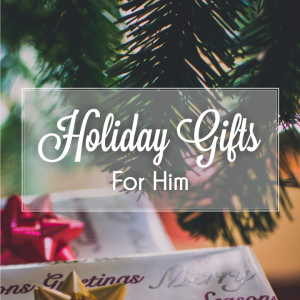 Whether you are shopping for your boyfriend, dad, brother, or just a friend. Memorable Gifts is your one stop shop to find that perfect gift for all the men in your life. Shopping for men can be a challenge, but Memorable Gifts is here to help you with some great personalized gifts. Check out our top 10 gift ideas for the men in your life! 1. Executive Business Desk Journal with Wooden Cover – For the business man in your life this executive journal is perfect for him to use in the office, carrying in a briefcase or for his next business trip. Personalize the wooden cover with the recipients name or initials to makes a truly memorable gift. 2. Monogrammed Beer Glass – The beer lover in your life will be excited to enjoy his next beer in this personalized monogrammed beer glass. This gift is the perfect compliment to any home bar. 3. Classic Black Leather Flask with Silver Detailing – Make a statement with this luxurious black leather flask this holiday season. Add personalization to the flask to ensure that your gift will always be remembered. 4. Personalized Shot Glass – Let the good times roll with a personalized shot glass. Make this shot glass a truly great gift by personalizing it to read anything from a name and date to a short message. 5. Stylish Round Rhodium Cufflinks – Purely elegant and contemporary, these 5/8” silver cufflinks are a gift that will certainly put a smile on his face Christmas morning. 6. Blackstone Engraved BBQ Set – The three piece Blackstone engraved BBQ set is the perfect gift for Him. This BBQ set includes oversized tongs, fork and a slotted spatula with a built in bottle opener that is all in a sturdy personalized aluminum carrying case. 7. Unique Black Leather Travel Tie Case with Hanger – That special guy in your life will never have to worry about having wrinkled ties again while he travels with this unique black leather travel tie case! The exquisite leather travel tie case is the ideal gift for taking on either business travel trips or when traveling for leisure. 9. Custom Billiards Sign – A custom billiards sign is a great addition to any home bar, billiards room, or garage. Personalized with the recipient’s name and a year to make a truly unique gift that will make all his guy friends jealous. 10. Rosewood Clock and Pen Stand – This beautiful rosewood personalized desk clock is sure to bring style and attention to his office. With custom engraving this clock makes a truly special Christmas gift!